This is the fourth chapter of the ketosis series. I am a neurologist, as many people reading this know. One of the many reasons I chose to pursue neurology is that it is probably the most varied, complex, and interesting field in medicine. However, like all specialties there are downsides. Perhaps the largest downside to neurology has always been its relative inability to slow down or cure common neurological conditions such as stroke, epilepsy, Alzheimer's disease, and Parkinson's disease. The evidence presented so far in this series supports the notion that ketosis may be the key to stomping out this traditional weakness by slowing down or even reversing these neurological conditions. This is not fantasy - it's reality. When I raise the option of going ketogenic either through fasting or a high fat diet or both, the most common response from a patient is one of utter astonishment followed by immense relief. Believe it or not, many patients with chronic neurological conditions have already heard about ketosis and have already considered it as an option. However, they never raise the issue with their doctors for the simple reason that ketosis is nearly universally met with scorn and criticism by medical professionals, people who criticize what they do not understand. After the patient has recovered from the initial shock of finding a doctor who believes in ketosis, we have an extended discussion and we make a plan to go ketogenic. This is not so hard as most people make it out to be, nor is a ketogenic diet "unpalatable" as so many people make it out to be. Upon glimpsing the truth of this, every single one of these patients leaves the office with a smile. They have found hope, they have made a plan of action, and they are highly motivated to take partial or complete control of their condition without exclusively relying on regular visits to a doctor who is all too often more concerned with treating symptoms rather than curing disease. In going ketogenic, the major problem most people face is not the fasting or the high fat diet, it is the breaking of their life-long addiction to three meals a day plus snacking on processed carbohydrates. Make no mistake - it's an addiction, which the dictionary defines as a strong and harmful need to regularly have something (1). How many times I have heard someone say the following? "What, skip a meal during the day? I'll be starving, I won't be able to concentrate!" or "Eat 80% fat? That's terrible - I need some carbs!" These are the words of an addict, a person who has a strong and harmful need to consume food on a regular basis, much of which is processed carbohydrates. This behemothic hidden addiction lies at the heart of the most insidious chronic diseases of our times and it's about time we called a spade a spade. When a person decides to go ketogenic, breaking this hidden addiction is the hard part, especially when there is a dearth of support from family, friends, and especially medical professionals with their pills. Yet if a person can get past the initial several weeks, break the hidden addiction and keto-adapt, things improve. Vastly. The hunger pangs disappear. Completely. The cravings for bread, pasta, rice, juice, and sugar go away. Entirely. In fact, it is only once a person has broken their hidden addiction to three meals a day plus snacking on processed carbohydrates that they truly realize the insanity of their previous lifestyle habits. Furthermore, once the hidden addiction has been snapped, the perception that high fat meals are "unpalatable" simply vanishes - for that's all it ever was, a mere perception based on a hidden addiction constantly reinforced by the medical profession. ​Breaking the hidden addiction is much easier with savoury high fat meals. Allow me to introduce you to some of my favourites. Until this chapter, I had been sticking to a somewhat regimented weekday eating program in the interests of achieving a high level of physiological ketosis. Having accomplished this I decided to try the opposite route, make the weekday routine easier to follow by increasing the calories, reducing the fasting intervals, and varying the meals. First, I increased the calories back to recommended caloric intake (2,600 calories) and reduced the fasting intervals to 16 hours (from 9 pm to 1 pm of the following day). In the morning, I skipped breakfast and had one or two black coffees. For lunch, I took in about 600 calories in the form of 50 g of double cream camembert cheese plus a fat bomb (one black coffee, one tablespoon of coconut oil, two tablespoons of pure cream, and plenty of ground cinnamon). In the evening, I ate a meal containing at least 2,000 calories. ​Second, I changed up dinner every day of the week; the recipes and photos for several of these ketogenic meals are shown below. I obtained all of these recipes from the internet, no cookbooks required. Most of them were derived from Craig Clarke's excellent ruled.me recipe website (2). I have to add that I am not an experienced cook nor am I an accomplished photographer, and so my culinary skills and the photos below do not do these meals justice. If you would like to see the recipes and gaze at some more professional photos, please go to the link that I have provided for each dish (I have not shown salad recipes - you can eat leafy greens to your heart's content when going ketogenic, so don't hold back). (1) Broccoli chicken zucchini boats. A marvelous concoction of broccoli, chicken, zucchini, sour cream, and cheddar cheese. This recipe is a great place to start. Total 953 calories, 68 g fat, 60 g protein, 10 g net carbs. Ketosis does not exclude lasagne - and this is one heck of a lasagne. This recipe is loaded with ground beef, onions, and spinach as well as three different types of cheese (cream, mozzarella, and parmesan). I always find it difficult not to eat all of this in one go. Give it a shot! Total 2,782 calories, 234.4 g fat, 135.2 g protein, 24.8 g net carbs. (3) Salmon with Tarragon Dill Cream Sauce. This recipe is magnificent. The tarragon cream sauce really cranks up the fat content. Don't forget to throw in a bunch of asparagus spears wrapped in bacon strips on the side. Total 1,143 calories, 95 g fat, 60 g protein, 6 g net carbs (including seven asparagus spears and three bacon strips). (4) Bacon, avocado, and chicken sandwich. ​Forget regular bread - go keto cloud bread. The mayonnaise mixed with barbecue sauce is unreal. I always double this recipe. Total 1,444 calories, 113 g fat, 88 g protein, 8 g net carbs. Yes! You can still eat pizza and stay in ketosis, and unlike regular pizzas which leave you feeling bloated and foggy afterwards, you will feel energized and alert even after eating this almond flour pizza all at once. Which is easy, by the way. Total 2,007 calories, 162 g fat, 109 g protein, 19 g net carbs. (6) Reverse seared ribeye steaks. Simply incredible. The steaks are cooked at low temperature, seared in bacon fat, and loaded up with mushrooms and vegetables on the side. In all seriousness, this may be one of the best steaks you have ever had. Total 1,489 calories, 108 g fat, 98 g protein, 11 g net carbs (including 100 g mushrooms, 200 g green beans, and one tablespoon of butter). (7) Peanut butter and chocolate chunk mud cake. Did I forget dessert? If you love peanut butter and dark chocolate (wait a minute, that's everybody), then you will love this amazing recipe - and it only takes five minutes to put together. Total 488 calories, 47 g fat, 13 g protein, 5 g net carbs. (8) Caramel pots de creme. Going ketogenic does not mean forsaking sweet desserts. In fact, you may not want to return to sugar after trying this recipe. Don't believe me? Well, there's only one way to find out - try it! Total 1,437 calories, 139.7 g fat, 11 g protein, 12 g net carbs. ​Do these extremely high fat meals seem "unpalatable" to you, or are they somewhat tantalizing or perhaps even definitively awesome? I know where I stand. Consider this the next time someone turns up their inerudite nose at the mention of a high-fat ketogenic diet. Over these six weeks of experiments, I decided not to track my daily macros (amounts of fat, protein, and carbohydrate) and simply concentrated on maintaining recommended caloric intake, sticking to the 16 hour fasts, and eating delicious meals really high in fat. 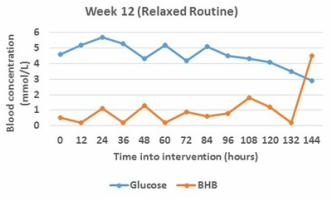 Figure 1 below shows blood glucose and BHB concentrations for the final week of the experiments (relaxed routine). The mean blood glucose concentration was 4.53 mmol/L whereas the mean blood BHB concentration was lower than what I'm used to at only 1.04 mmol/L. The results above were typical for other weeks. Clearly, increasing the caloric intake, reducing the fasting intervals, and not strictly controlling the daily macros resulted in a higher mean blood glucose and a lower mean blood BHB concentration compared to the weeks in previous chapters. However, the mean blood glucose of 4.53 mmol/L was still quite low, and the mean blood BHB concentration of 1.04 mmol/L still sat within the range of nutritional ketosis. Now to assess the effects of a more relaxed routine on a mental, physical, and social level. Cognition was easy to assess for the reason that I subjectively detected zero negative effects on cognition. I was never fatigued, never hungry, and the meals were exquisite. What more can I say? Figures 1, 2, and 3 below relay the strength analysis for the Saturday evening resistance session. The x-axis shows the particular resistance exercise and the x-axis shows the number of repetitions done. For all weekends, the resistance session was done at a high level of physiological ketosis on Saturday evening. 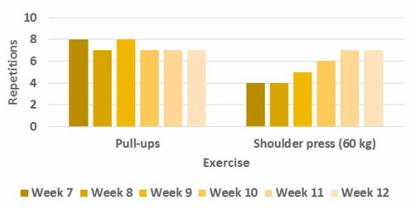 Body weight was measured at the same time on both days using the same scale while all exercises were done in the same order using the same equipment and the exact same weight (please note that the weights for bench press and squats were increased compared to previous weeks, and flies were replaced with shoulder press). Immediately prior to these workouts. I recorded a blood glucose concentration as low as 2.7 mmol/L and a BHB concentration as high as 6.9 mmol/L. Despite these extreme concentrations, I noted no adverse physical effects on performance during the 20 minutes of exercise. Table 1. Pre-workout blood glucose and BHB concentrations, body weight, and total repetitions for the resistance session at the end of each week. During these six weeks, the weekday meals were more expensive and required more time to prepare compared to previous chapters. The weekday expenses averaged $37.08 USD per day, well over twice the cost of the more regimented standard weekday meal used in previous chapters. In addition, preparation time averaged nearly one hour - although much of that hour was oven time, so perhaps that doesn't really count. Hopefully you no longer view high fat ketogenic meals as "unpalatable." Take-home points from this chapter are as follows. (1) Ketosis has the potential to slow down or reverse the most influential neurological conditions of or times. (2) Patients are often interested in going ketogenic but many medical professionals lack a true understanding of its benefits resulting in barriers to its implementation. (3) The hardest part about going ketogenic is breaking the hidden addiction to three meals a day plus snacking on processed carbohydrates. (4) Fact - proper high fat ketogenic meals are not "unpalatable," they are delectable. (5) The relaxed routine of returning to recommended caloric intake, reducing the fasting intervals to 16 hours, and mixing up the meals without paying much attention to macros resulted in a lower level of physiological ketosis (mean blood BHB concentration of 1.04 mmol/L) over the five weekdays. (6) Mentally - zero negative effects on cognition over these six weeks. (7) Physically - generally, strength continued to increase over the six weeks. (8) Socially - preparing a different high fat meal every night of the week was somewhat costly and required extra time. These meals were an absolute pleasure to prepare and eat. 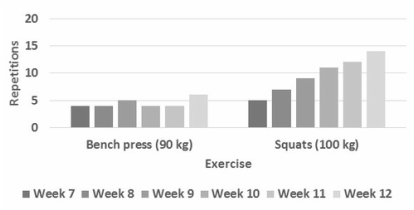 However, it would be nice to push the mean blood BHB concentration higher over the five weekdays while at the same time continuing to extend the strength gains. To this end, a dramatic change in strategy may be required - how it unfolds, remains to be seen.